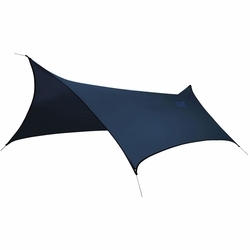 ENO ProFly XL Rain Tarp. Bigger isn't always better, but with the ProFly XL it's perfect. A full 2 feet longer and 3 feet wider than our most popular tarp, the ProFly, this sleek and versatile rain cover will keep the elements away in every season. The streamlined rectangular shape and six guy points allow for a large footprint and effective shelter from sudden downpours to blazing sun, and everything in between. The streamlined rectangular shape and six guy points allow for a large footprint and effective shelter from sudden downpours to blazing sun, and everything in between. The durable PU Coated Nylon Taffeta Ripstop body and stitched, taped seams will allow you to venture to even the most remote locations without fear of gear damage and, when your're done, pack the 28oz tarp down in its included storage sack and easily slip it into the side pocket of your pack. Eagles Nest Outfitters. Dimension: (L x W) 13' x 9' 2"